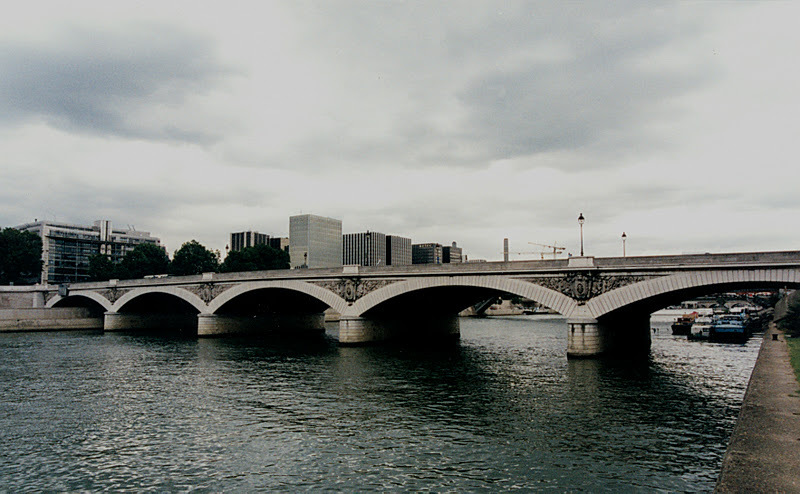 Pont d'Austerlitz is a five span masonry arch bridge over the River Seine in Paris. It replaced an older bridge that was built in 1805. The new bridge has five 32 m (105 ft) spans and was 18 m (60 ft) wide, but it was widened in 1884 to 31 m (102 ft). I wonder if the ornamentation on the spandrel walls above the piers was removed from the original bridge and put on the new bridge and on the widening? Austerlitz is where Napoleon won one of his biggest battles in 1805, the year the original bridge was built. The ornamentation is of a lion holding up a shield, an image of war. Seine River Bridges: Pont d'Austerlitz by Mark Yashinsky is licensed under a Creative Commons Attribution-NonCommercial-ShareAlike 3.0 United States License.